Still trying to get to the bottom of my image/server woes. It's at these times I feel utterly helpless, depending on my kid's computer expertise to figure out and fix the problem. Bless their generous hearts for helping out old Mr. Low-Tech. Meanwhile, just so you'll have something to look at--here's some photos I took Sunday, as the Cycle Oregon riders came to Union. Click images to enlarge. I snapped this shot from the upstairs window of my studio on Union's Main Street. 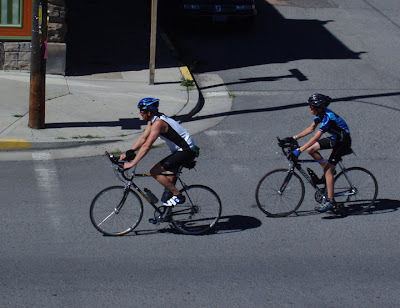 These are just two of two thousand riders on the tour this year, a 250 mile loop through northeast Oregon. They came streaming into town all day today, to cheers and welcome signs from the friendly locals. 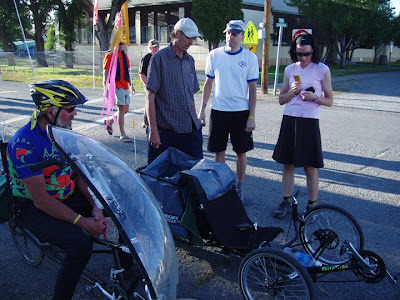 My friend, artist and writer Dan Price from Joseph came rolling in with the Cycle Oregon crew on his Terra Trike. He paid a visit to the studio and we caught up on old times. Dan is an amazing guy who makes hand-written and illustrated journals of his life and travels. 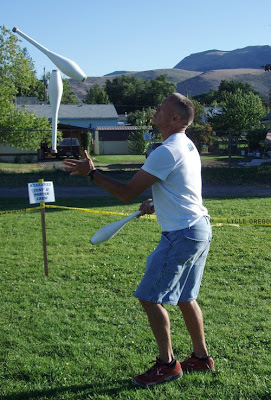 Visit his blog to get a taste of what he does, then check out his journals at Moonlight Chronicles. Here's Dan (gray shirt) showing his customized Terra Trike to fellow riders. He recently completed a 4500-mile ride across the U.S. in this machine. 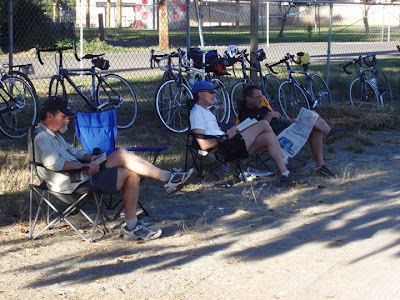 The bikers camped behind the high school, effectively doubling the size of Union for one night! The ride is quite a logistical feat. Volunteers (maybe former circus workers?) 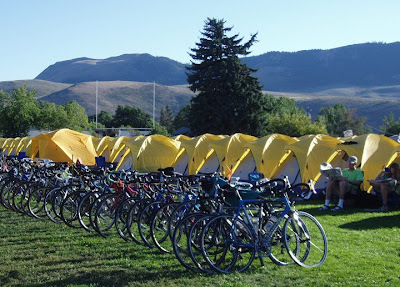 travel ahead of the riders to set up camp, then strike the tents the following day to head for the next camp. There are baggage trucks, portable showers, port-a-potties and who knows what else to lug along. Oh, and they feed hot meals to this benign traveling army as well. Kicking back after the day's trek.